Definition at line 52 of file llgivemoney.h. Definition at line 81 of file llgivemoney.cpp. References LLUICtrlFactory::buildFloater(), LLFloater::center(), LLPanel::childSetAction(), LLPanel::childSetEnabled(), LLPanel::childSetKeystrokeCallback(), LLPanel::childSetPrevalidate(), LLPanel::childSetText(), LLPanel::childSetVisible(), FALSE, LLUICtrlFactory::getButtonByName(), LLSelectMgr::getEditSelection(), gSelectMgr, gUICtrlFactory, i, llformat(), mCallbackData, mObjectSelection, mQuickPayButton, mQuickPayInfo, onCancel(), onGive(), onKeystroke(), LLFloater::open(), PAY_BUTTON_DEFAULT_0, PAY_BUTTON_DEFAULT_1, PAY_BUTTON_DEFAULT_2, PAY_BUTTON_DEFAULT_3, LLLineEditor::prevalidateNonNegativeS32(), S32, LLPanel::setDefaultBtn(), and sLastAmount. Referenced by payDirectly(), and payViaObject(). Definition at line 178 of file llgivemoney.cpp. References LLCacheName::cancelCallback(), gCacheName, mCallbackData, mTargetUUID, and onCacheOwnerName(). Definition at line 374 of file llgivemoney.cpp. References LLPanel::childSetFocus(), gCacheName, LLCacheName::get(), LLUICtrlFactory::getLineEditorByName(), mTargetIsGroup, onCacheOwnerName(), LLLineEditor::selectAll(), and TRUE. Definition at line 445 of file llgivemoney.cpp. References LLPanel::childGetText(), FALSE, LLViewerObjectList::findObject(), gAgent, LLAgent::getRegion(), LLViewerObject::getRegion(), gObjectList, LLPrimitive::isAvatar(), mCallback, LLSelectNode::mName, mObjectSelection, mTargetIsGroup, mTargetIsObject, mTargetUUID, LLStringBase< char >::null, NULL, S32, sLastAmount, TRANS_GIFT, and TRANS_PAY_OBJECT. Definition at line 388 of file llgivemoney.cpp. 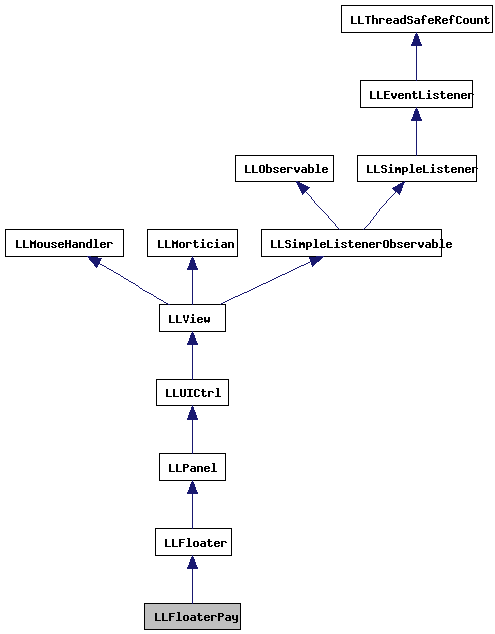 Referenced by finishPayUI(), and ~LLFloaterPay(). Definition at line 413 of file llgivemoney.cpp. Definition at line 435 of file llgivemoney.cpp. References LLFloater::close(), give(), LLGiveMoneyInfo::mAmount, and LLGiveMoneyInfo::mFloater. Definition at line 423 of file llgivemoney.cpp. Definition at line 354 of file llgivemoney.cpp. References LLPanel::childSetVisible(), FALSE, finishPayUI(), i, LLFloaterPay(), MAX_PAY_BUTTONS, mQuickPayButton, S32, and TRUE. Referenced by complete_give_money(), and handle_pay_by_id(). Definition at line 320 of file llgivemoney.cpp. 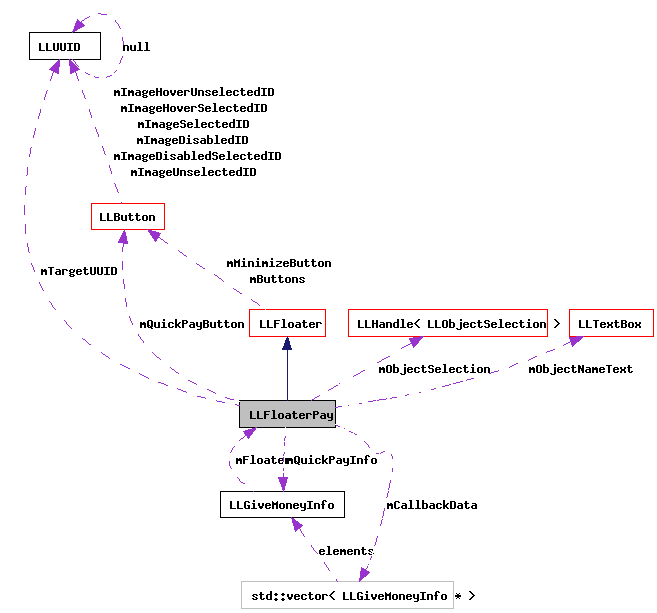 References _PREHASH_ObjectData, _PREHASH_ObjectID, _PREHASH_PayPriceReply, _PREHASH_RequestPayPrice, LLMessageSystem::addUUIDFast(), LLFloater::close(), FALSE, LLViewerObjectList::findObject(), LLViewerRegion::getHost(), LLPermissions::getOwnership(), LLViewerObject::getRegion(), gMessageSystem, gObjectList, LLFloaterPay(), LLSelectNode::mName, mObjectSelection, LLSelectNode::mPermissions, LLMessageSystem::newMessageFast(), LLMessageSystem::nextBlockFast(), processPayPriceReply(), LLMessageSystem::sendReliable(), LLMessageSystem::setHandlerFuncFast(), and TRUE. Definition at line 187 of file llgivemoney.cpp. References _PREHASH_ButtonData, _PREHASH_DefaultPayPrice, _PREHASH_ObjectData, _PREHASH_ObjectID, _PREHASH_PayButton, FALSE, FASTPAY_BUTTON_WIDTH, LLResMgr::getMonetaryString(), LLMessageSystem::getNumberOfBlocksFast(), LLResMgr::getRes(), LLMessageSystem::getS32Fast(), LLMessageSystem::getUUIDFast(), LLFontGL::getWidth(), gResMgr, i, llabs(), LLFONT_SANSSERIF, llformat(), MAX_PAY_BUTTONS, NULL, PAY_PRICE_DEFAULT, PAY_PRICE_HIDE, r, S32, LLMessageSystem::setHandlerFunc(), target, and TRUE. Definition at line 88 of file llgivemoney.h. Definition at line 87 of file llgivemoney.h. Referenced by LLFloaterPay(), and ~LLFloaterPay(). Definition at line 93 of file llgivemoney.h. Definition at line 89 of file llgivemoney.h. Definition at line 98 of file llgivemoney.h. Referenced by give(), LLFloaterPay(), and payViaObject(). Definition at line 95 of file llgivemoney.h. Referenced by LLFloaterPay(), and payDirectly(). Definition at line 96 of file llgivemoney.h. Definition at line 92 of file llgivemoney.h. Referenced by finishPayUI(), and give(). Definition at line 91 of file llgivemoney.h. Definition at line 90 of file llgivemoney.h. Referenced by give(), and ~LLFloaterPay(). Definition at line 100 of file llgivemoney.h. Referenced by give(), and LLFloaterPay().